Mobile Phone Buddy | OhGizmo! Anyway, pictured here is a cord and bag for attaching this crud to your mobile phone. According to Compact Impact it is a breed of fresh water algae. Yes, I said algae. This is the same gunk that I clean out of my beta’s (in case you were wondering his name is “Smooches???) fish bowl, which is exactly what I need to hang around my Razor to prove my street cred’. Anyway, I’d like to see more living organisms that can be attached to my mobile devices. Next on my wish list would be a miniscule genetically engineered child whose sole purpose in life is to keep my Ipod clean. This thing is filthy! Buy your bag of algae for $8 at Compact Impact here. crud & gunk in 1 post. Why, I’d Like to Attach Horse Dung to My Phone! […] isplay” if you can’t find them. 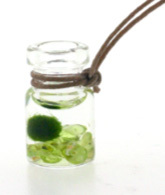 They also carry the previously featured “marimo“.